Needless to say, I’m thrilled with these early signs that Canadians are enjoying Up and Down. I’m still working out how best to talk about Up and Down, and which sections to read at events. But, it’s coming. I figure I should have it sorted out by the time I’m back home towards the end of the month. What a happy whirlwind. Stay tuned and thanks so much for all the encouraging feedback. It means a lot to me, particularly with the new novel still so fresh on the shelves. I finished your book this week. Well…I started AND finshed it this week. Another very good ‘read’ with audible laughter from me. If I may suggest a good section for a reading – the meeting with Hector will, I’m sure, garner good reactions. I heard you speak to Probus in Collingwood in the Spring and waited patiently for the publication of “Up and Down” from that day. I didn’t read it on-line because I find reading from the screen difficult. What has happened with the radio dramatization of “The Best Laid Plans”? Did the CBC cuts to radio drama mean that it will not be done? I would like to congratulate the publishers or whoever decided to double space the book. It made it easier to read. I’m glad you enjoyed it. As for the CBC and The Best Laid Plans, it’s actually a six-part television miniseries and all is proceeding according to plan. The six scripts are due at CBC by the end of December. If they are approved, we move on to casting and, if all goes well, eventually filming. Fingers crossed! Wow, The Best Laid Plans on TV, that’s really cool. 🙂 Are you writing the scripts, or is someone else making the adaptation? 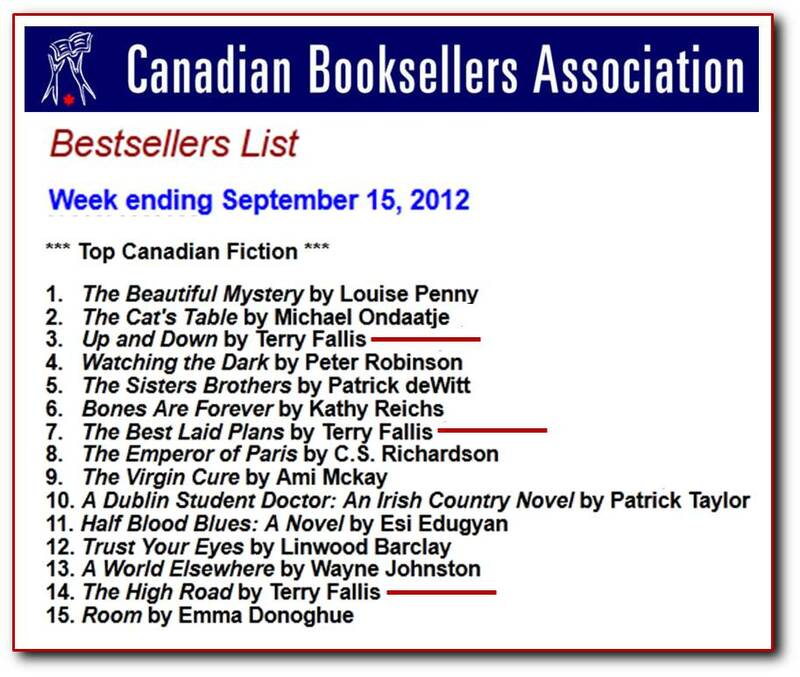 Hey Terry – Canadians living in the USA want to read it too! Can you upload a prc file for kindles to amazon.com? Thanks! And congratulations on all your success! Hi Lizz. The good news is, Up and Down will be hitting U.S. bookstores in the fall of 2013, including ebooks. The bad news is, that’s still nine months away. Sorry about that! I attended your reading a Chateau De Charmes tonight . Thank you so much.I had just finished reading Up and Down last week. Once again, as in Best Laid Plans and The High Road, your characters come to life. Your books are so humourous and so unique that when I finish reading the book I always want more! I look forward to No Relation as I have no doubt that I will love those characters also.